On 26 December 1985, 84 former miners and family members of 39 former diseased miners from the region Chikuhô in Kyûshû, supported by a group of lawyers already linked to other famous cases of pollution, such as that Minamata, filed a lawsuit against the state and six big mining companies. These miners were victims of an incurable and particularly atrocious illness called, in Japan, jimpai - pneumoconiosis in French - which causes a slow death by asphyxiation in people breathing silica or coal dust. After nearly ten years of proceedings, July 20 1995, the Fukuoka district court ordered the six mining companies to pay 197 million yen in damages to about 104 victims, but did not recognize the responsibility of the State. After settlements with Mitsubishi, Sumitomo and Furukawa, July 19 2001, on appeal, the Fukuoka High Court ordered the three remaining companies, and the state, to pay 1.91 billion yen. April 27 2004, after a settlement with two other companies, the Supreme Court of Japan finally pronounced against Nittetsu and state and granted a total of 566 million yen in compensation to complainants. This process produced a large amount of documents. These records, kept at the University of Kyûshû, consist of preparatory documents assembled by the defence, witnesses' auditions (miners, experts, executives,...), statistics and surveys, inspection sheets and biographical elements on victims. These documents are especially valuable for the historian because they starkly reveal the extent of what was the social invisibility of this disease. Historical writings themselves also show this invisibility. The question of the history of occupational health is generally quite absent from labor history in Japan. In addition, there is a very surprising lack of any mention of pneumoconiosis in the abundant literature on the social history of coal mining. Examples include the very thick volumes on the history of Fukuoka Prefecture, where the history of mining occupies several volumes, the descriptions by Ueno Hidenobu, who was a minor himself, of the poor living conditions of the inhabitants of Chikuhô, or even a description of the working conditions very difficult and violent customs of the mine by Sakubee Yamamoto, who worked as a miner for 50 years, in a series of 700 illustrations that were recently classified as World Heritage by the Unesco (see illustration). But it is surprising to note the absence of any mention of lung disease due to dust, while explosions of firedamp or coal dust and their victims are thoroughly discussed, as if these illnesses had never held any significant role in these mining communities and their memory. But beyond this surprising absence of pneumoconiosis in the social history of coal in Japan, despite a large number of scientific studies demonstrating the reality of this epidemic, the social invisibility of the disease results in an under recording in official statistics that there is every reason to regard as very important, even though the Pneumoconiosis Act of 1960 had institutionalized mechanisms for screening and financial compensation by social insurance. To understand the mechanism that fuelled the invisibility of victims of pneumoconiosis, even after its institutional recognition in 1960, as illustrated by the very existence of this trial, we must first realize that the recognition of this disease, which first symptoms occurre long after the dust began their work of destruction of the lung, depends on a medico-legal definition. The conduct of regular medical visits, the interpretation of radiographs and the clinical examinations and the decision to grant financial compensation to the worker depend not only of medical decisions but also of administrative ones. I.e. it depends on standards and practices that are the result of a power struggle between an industry that has been always been able to impose its medical expertise and workers who were in a position of great weakness. This weakness was particularly labor unions one. 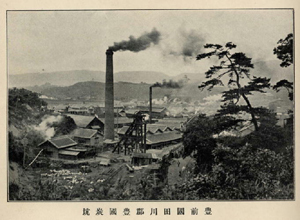 After the Meiji Restoration in 1868, large reserves of coal were discovered and developed at a rapid pace to provide the energy needed for the emergence of a modern, industrialized nation. In this context, trade unionism was severely repressed until 1945. But the rise of unions after 1945 was immediately followed, in the 1950s by an early decline of the mining industry and an overabundance of labor which largely emptied the unions bargaining power. In addition, rather than occupational health issues, unions put especially emphasis on the problem of unemployment as the industry was subject to successive rationalization plans. The boom called Jimmu (Jimmu keiki) which saw the production of coalmines increased by 40% in 1956-1957, represented the last period of prosperity for coal. From 1959, the industry began to collapse. Throughout this period, the major industrial groups continued their strategy of investing in other activities, rather than putting money into an industry that was inherently unstable. In Chikuhô, between 1956 and 1959, 22,900 workers lost their jobs. In 1970, there were only five mines in this region although there were up to 256 after the Second World War. Beyond the weakness of the labor movement, we must also take into account the existence of a kind of cognitive barrier against certain risks. We must realize how much the mine labor was subject to a specific environment with pervasive violence and risk perception monopolized by the explosions. There was always a coexistence of large mines held by the big industrial groups and much smaller units with little capital owned by local entrepreneurs. In these small mines called tanuki bori (tanuki holes, the tanuki being a wild canid widespread in the Japanese archipelago) which operated with networks of shallow galleries, safety standards were rarely observed. But all mines in the Chikuhô basin were subjected to a particularly high risk of penetration of gas and water due to the activity of the crust and the volcanic nature of the region. In addition, mine operators have tended not to invest adequately in their mines to improve safety and to try to increase production with the existing facilities and workforce. Thus, the accident rate in the mine area was remarkably high. We can estimate the total number of deaths in the region alone Chikuhô to over 11,000 for the period from 1922 to 1965, in the large mines alone, reliable statistics being not available for small mines. If security in the smaller mines, but also the largest, was so neglected, it is also because miners labor was always attached to a very low social status. 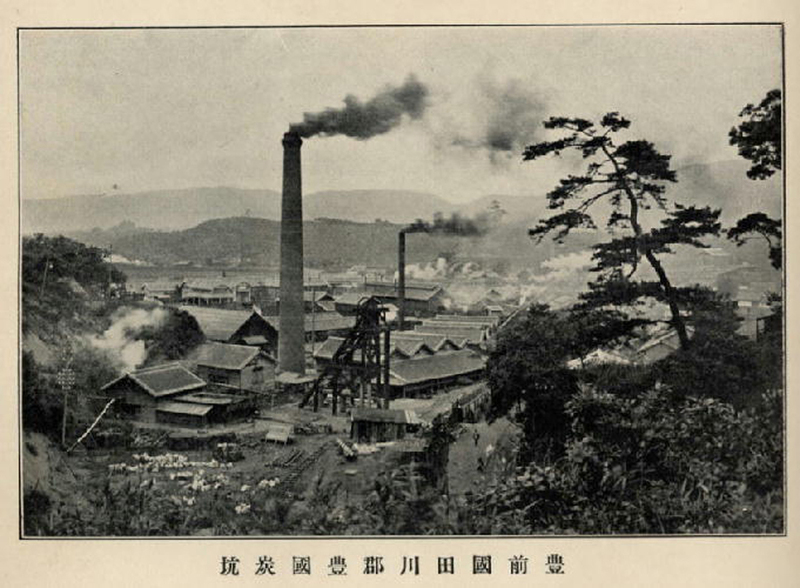 There was, at the beginning of the industrial revolution, the widespread use of forced labor, and with the industrialization of extraction after the Meiji Restoration, mining attracted buraku populations of neighbouring regions of Kyûshû. 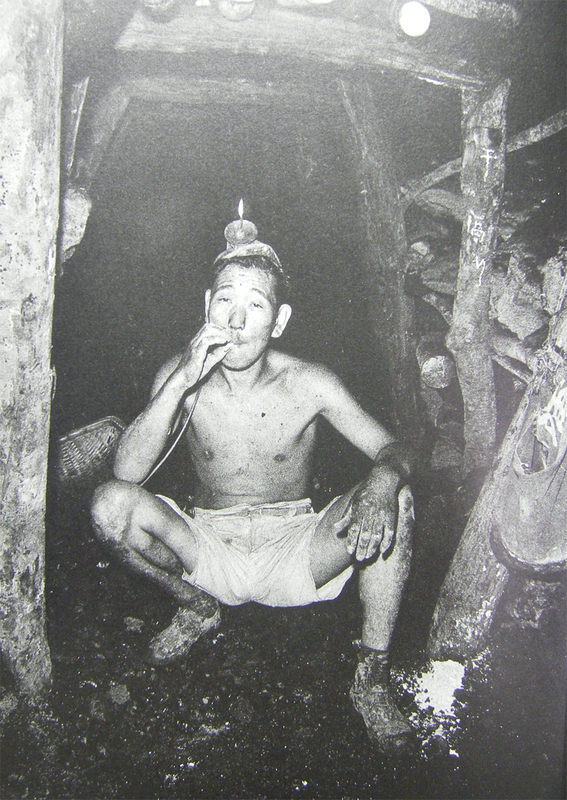 The burakumin were used as hitoguri eg, awaking miners and sending them to work, or as supervisors. In addition, since 1930, to replace the women and children who could no longer work in the galleries after the reforms inspired by the International Labour Organisation, there was extensive use of Korean workers. They were often sent to places sensitive areas gas accumulations due to poor ventilation where the Japanese would not go. During the Second World War, there was a wide use of forced labor of Koreans, which represented up to half of the workforce in some mines, but also Chinese. In addition to their low social status, workers were subject to a particularly oppressive system called naya-hamba. In this system, a subcontractor, known as nayagashira, watched day and night workers who were under his authority, he housed and fed them in a sort of barrack dormitory called hamba. Before and during the Second World War, this system could be linked, in some small mines notoriously violent, to supervisors (rômugakari) sometimes associated with the local underworld. The nayagashira was generally responsible for recruiting workers, often at his own expense. Once he hired a group of workers, he assigned them the task on the vein on the basis of the orders of the company. Even within the same mine, it was relatively easy to remove the coal on some walls while it was harder on others, this leading to large wage differentials. This power was still raised by the fact that not only they calculated and paid the wages of miners, but they sold them the equipment they needed for work and often lend them money. They were present in all aspects of their daily lives. This left the minor in a state of perpetual debt, both financially and socially. 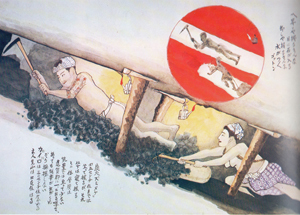 In the region of Chikuhô, even in the period after the war, according to the mine where he worked and the seriousness of the offense, the miner could be subjected to a series of corporal punishment. In extreme cases, a miner who escaped could even be hanged or beaten to death with a sword or a knife as an example for the others. The fact the pneumoconiosis trial occurred very late, nearly two decades after the closure of most mines in the region, is a strong demonstration of all these barriers to the recognition of the disease. Such a trial was not possible as long as the workers were employed by a mining company, and they were members of a local community dependent on the coal industry. Most miners began to sue the mining companies, and to make their disease socially visible, once these companies have completely abandoned the region Chikuhô and at a time when they had become entirely dependent on public welfare. The paradox of this situation is that if these miners and their family have been able to achieve a social citizenship that medical expertise, funded by industry and the government, was never able to give them, this victory finally came in a world already disappearing.